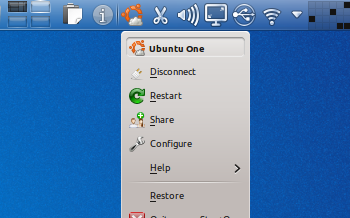 UbuntuOne for KDE is finally ready. Well, sort of - the first "real" alpha has been released and there's an Kubuntu PPA available which will only work with the latest Kubuntu 10.10 Maverick Meerkat. Even though it's in alpha, everything in UbuntuOne for KDE should work but still, expect to find bugs! Known issue: in case the "ubuntuone-client-gnome" package is installed, make sure you remove it before installing "ubuntuone-kde". Note: I do not use KDE so I didn't test this!